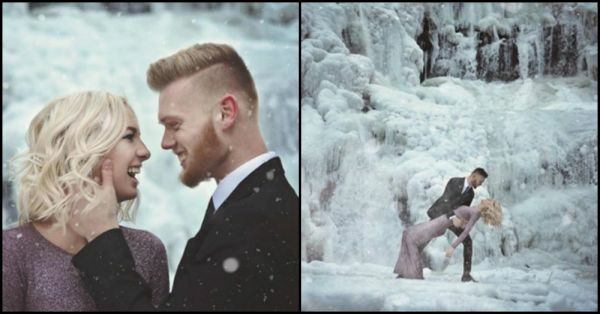 This Couple's Icy Photo Shoot Will Give You All The Chills! What comes to your mind when you think about an engagement photo shoot? A dreamy beach or hillside setting, funky props and vibrant colours, right? That's exactly what Tennessee-based couple Josh Morris and Morgan Daye had in mind when they decided to do their couple photo shoot. The lovebirds shortlisted Bald River Falls as the location but were in for a magical surprise when they arrived there in below freezing temperatures (-3 degree C). Lovebirds Josh and Morgan managed to get some beautiful shots at the winter wonderland, thanks to their photographer Kellie Elmore. The happy couple is all set to tie the knot in May this year. We wish them all the love and luck. If you are awestruck by their icy shoot, here's a glimpse of how it came alive. Don't their pictures look straight out of a winter wonderland? !